Black Ice Software - A Complete MODI Replacement! Microsoft Office Document Imaging (MODI) was removed in Microsoft Office 2010, leaving many companies and users without a definitive alternative. Many businesses that are dependent on MODI are now hesitate to upgrade their systems as finding an alternative to MODI required piecing together different solutions from different companies. With MODI, users were able to view, scan, edit, save, OCR, and convert single and multipage TIFF files all in one location. 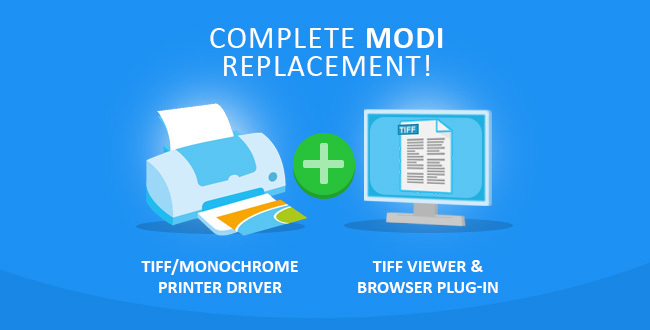 Since the discontinuation of MODI in 2010, Black Ice Software has been increasing our features while improving the user interface of our Tiff Viewer and Tiff Printer Driver to be a complete MODI replacement tool. With a slick user interface similar to that of MODI; users will no longer have to completely relearn a new interface as the tools and features of the Tiff Viewer and Printer Driver are all similar to the once popular Microsoft Office Tool. While Microsoft no longer supports MODI, Black Ice Software has been selling and supporting our Tiff Viewer and Tiff Printer Driver solution for over 15 years. With the Black Ice Tiff Viewer and Tiff Printer Driver you can once again have a full MODI solution supported and provided by a single company. Our solutions are also supported on all windows operating systems including Windows Server 2016 and Windows 10 with no end in sight. Contact our sales team and take advantage of this special opportunity for your whole company with our corporate licensing.